Posted July 5, 2016 by Shopping ForHealth & filed under Recipes. When warm weather hits, the last thing many of us want to do is turn on a hot oven. These are the days when entrée salads served for dinner have much appeal. Here is a salad recipe that is rich and filling enough to satisfy dinnertime appetites, but summerlike refreshing at the same time, thanks to the addition of grapes. 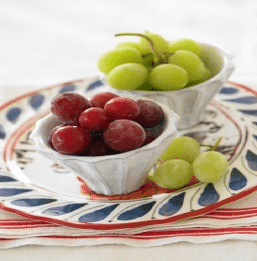 Grapes have a juicy sweetness that complements the mild flavor of shrimp, and their crisp bite adds to the crunch of the celery and water chestnuts. The grapes also have a nice tang that contrasts with the full-bodied dressing. This recipe from the California Table Grape Commission is perfect for a party on the patio, served either by itself or alongside whatever you’re grilling up on the barbecue. Enjoy it in different ways: mound the salad onto butter lettuce leaves, mix it with baby greens, or–for an especially summer-y treat, place a scoop inside an avocado half. 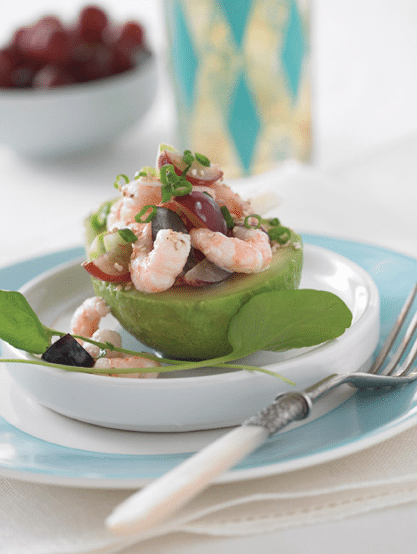 In a medium bowl, combine the shrimp, grapes, celery, water chestnuts and the sliced whites of the green onion. In a small bowl, combine the mayonnaise, sherry, salt, pepper, sesame oil and dry mustard. Gently mix with shrimp and grape mixture. Sprinkle with the sliced green part of the onion and the sesame seeds. Refrigerate until ready to serve. Serves 4. Nutritional analysis per serving: Calories 227; Protein 25 g; Carbohydrate 13 g; Fat 8 g; 31% Calories from Fat; Cholesterol 226 mg; Sodium 457 mg; Potassium 362 mg; Fiber 3 g.
Posted June 28, 2016 by Shopping ForHealth & filed under Breakfast. Bagels sometimes get a bad rap when it comes to nutrition. But there are many options available that can help you meet your nutrition goals. Look for smaller bagels such as mini’s or thins; whole wheat options are another great choice. If you’re really all about the cream cheese and toppings, whole grain crackers and rice cakes are other great options t o build upon. Those of us who love bagels know the schmear is really what matters! Arla Light cream cheese has just 60 calories, 5 gm fat and 3 gm saturated fat, compared to 200 calories, 23 grams fat and 15 gram saturated fat in the same portion of butter. No matter if you use a full fat or light variety, it’s important to keep the schmear light and focus on other flavorful, healthful ingredients to add. 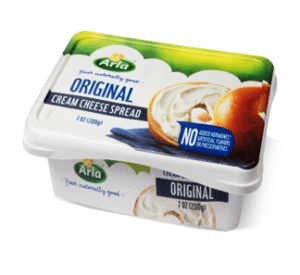 Arla Original cream cheese is made with just four ingredients: cream, buttermilk, cheese culture and salt. Most of us don’t get enough fruits and vegetables, so adding them in wherever possible, even in small amounts, can add up to big impacts in health. By placing raspberries and blackberries in a small bowl and smashing them with a fork, you’ve made a great replacement for jam or jelly. Or try topping bagels with cinnamon sprinkles, chopped walnuts, and thin slices of apple or pear. Posted June 14, 2016 by Shopping ForHealth & filed under Consumer Research, Fact/Information Sheets, Healthy, Ingredient. 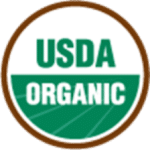 When you see the USDA Certified Organic label on food packages, what does that mean about the product, for you and your shoppers? Organic Valley, a farming cooperative and leading producer of organic dairy and meat products for almost thirty years, talked to supermarket dietitians at Shopping for Health 2016, explaining the benefits consumers may receive from choosing organic foods. Why does this matter to you and your store? Most important to supermarkets: the organic category continues to growth, as 51% of shoppers say that they are currently buying organic foods more often now than they were a year ago. This is an important observation, given that organic foods are 47% more expensive, on average, than their conventionally-produced counterparts, according to Consumer Reports. Posted June 6, 2016 by Shopping ForHealth & filed under Whole Grains. 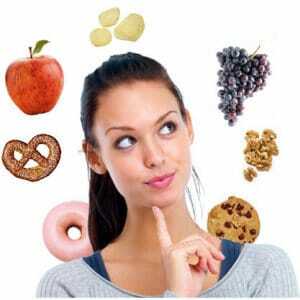 Nutrition experts say that adults need to eat 48 grams of whole grains every day. That sounds like a lot, but is it? And as a retail dietitian, how can you help your shoppers translate that recommendation to daily eating and meal planning? Whole grains are a good food to add to the diet during snacking occasions, because they usually package and transport easily and don’t have to be refrigerated. The trick is to teach shoppers to take advantage of their mid-meal cravings, as an opportunity to add some important whole grains. Options abound and are limited only by creativity or personal preferences! 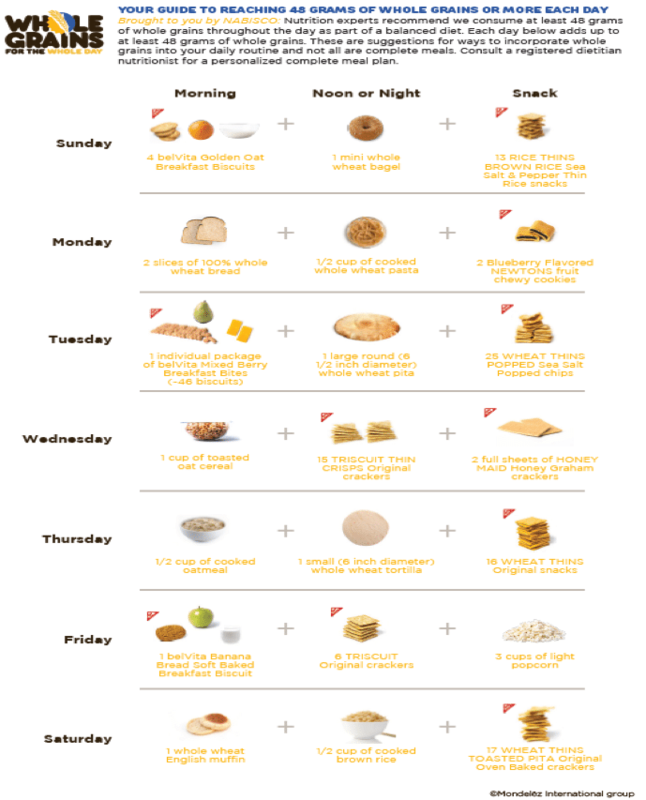 Here’s a chart developed by Nabisco that gives some starter ideas for snack pairings. Download at shoppingforhealth.org and use to help your shoppers consume the needed amount of whole grains every day. Posted June 1, 2016 by Shopping ForHealth & filed under News. Sometimes the simplest treats are simply the best. That’s definitely the case when it comes to one of the best summer snack foods: Frozen Grapes! Now that summer is officially here, make it a point to remind your shoppers how easy it is to prepare and store these mini-sorbet-like treats that also happen to provide nutrition benefits. Simply rinse, pat dry and place grapes in a re-sealable bag. Place in the freezer. Two hours later – and for up to a couple of weeks, if they last that long — they’re ready to enjoy. Frosty fresh grape pops are a cool treat for adults and kids alike. Because they are made with fresh fruit, they’re a good-for-you option compared to most desserts on a stick. Turn traditional gazpacho recipes upside down with green grape gazpacho. Lettuce, cucumber, grapes and more combine to put a new twist on an old favorite. For a refreshing sweet beverage to help beat the heat, whip up a grape agua fresca. Mix freshly made grape juice, a sprinkle of sugar and lime juice to taste, and you have a drink that may just dethrone lemonade as your summertime drink of choice. Add sparkling water for a bubbly spin. Make fresh grape salsa by combining fresh grapes, cilantro, and chilies with vinegar, onions and salt and pepper. Serve with chips or toasted crostini for a deceptively simple dish with an unforgettable flavor. For more cool grape recipes, visit www.GrapesFromCalifornia.com. Posted May 23, 2016 by Shopping ForHealth & filed under Protein. For shoppers interested in more plant-based eating, tofu and other soyfoods make an excellent protein choice. Heath Health – 25 grams of soy protein per day, as part of a diet low in saturated fat and dietary cholesterol, may reduce the risk of heart disease, according to the FDA health claim. Weight management – Protein rich soyfoods like tofu can help with weight management. When soyfoods replace other protein sources, they help lower body weight and fat, as well as lower LDL cholesterol levels. Muscle Growth and Recovery – Dietary protein provides both essential amino acids and calories necessary to help build and repair muscles, organs and tissues in the body, for physically active people. House Foods, with facilities in California and New Jersey, has been making organic and conventional tofu since 1983. Your customers may need assistance in reading their tofu product labels to determine which they prefer or should use for a particular recipe: products range from soft or silken, to medium-firm, firm and extra firm. The firmer varieties are best for grilling recipes and stir-fry recipes, while softer types are the best choice for smoothies and soups. In medium bowl, combine tofu and taco seasoning. Stir to coat. Add black beans and corn to two separate pots; set to medium heat. Heat until cooked through. Warm tortillas in a separate pan. 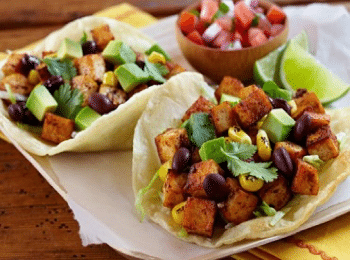 To assemble, spoon tofu, black beans and corn onto tortillas; top with lettuce. Add optional toppings as desired. Posted May 17, 2016 by Shopping ForHealth & filed under News. Is it time for a morning or afternoon snack? What little nosh would taste good right now, without blowing the day’s allotment for calories? The Almond Board of California asked shoppers what favorite foods come to mind as a healthy snack; apples topped the list, followed by almonds, carrots, yogurt and granola. These same consumers listed “high in fiber,” “high in protein,” and “natural” as the most important qualities they look for when searching for healthy snacks. The nut most likely to be associated with snacking? Almonds, by 30% of shoppers. Twenty-four percent responded by saying peanuts, followed by 19% who responded by saying cashews. Posted May 11, 2016 by Shopping ForHealth & filed under News. Did you know that 47% of the added sugars in the average person’s diet come from sugar-sweetened sodas and carbonated soft drinks? That’s a lot of added sugar being consumed in beverage form. The estimated daily consumption of added sugars is about 19.5 teaspoons (82 grams); the American Heart Association says the limit should be 6 teaspoons (25 grams) per day for women and 9 teaspoons (38 grams) per day for men. 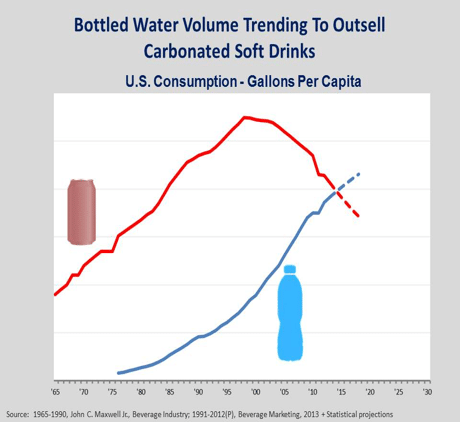 The good news is, a rise in consumption of bottled water is reversing the meteoric rise in soft drink sales that took place over three decades. Sales of carbonated soft drinks are at a 30-year low, and within the next few years, it is predicted that they will be outsold by bottled water. And, these are enduring trends. The younger the demographic, the higher the consumption of water, bottled and otherwise. Thirteen to twenty-four year olds comprise a generation for whom pizza and water, pretzels and water or burgers and water are the norm. We know that this is a positive trend for public health but beyond this, what does this mean for supermarkets? When shoppers make the switch from carbonated soft drinks to still or sparkling bottled water, they are changing to products that are more profitable for your stores, turn with a higher velocity and are seeing a faster pace of growth. Basket rings average 82% higher when bottled water is purchased. Bottled water is also one of few grocery products that allows consumers to trade up to a healthier product while receiving the benefit of a lower cost, as bottled water is typically half the price of soft drinks. Posted May 3, 2016 by Shopping ForHealth & filed under Dairy. 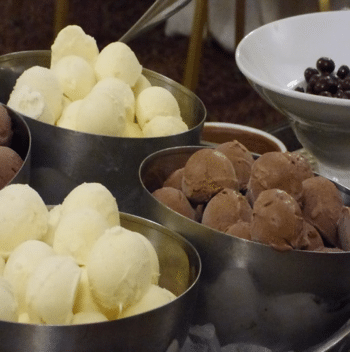 Retail dietitians attending the Shopping for Health 2016 conference in Austin, Texas had a memorable treat at our opening night Welcome to Texas Party: Line-dancing, followed by a house made ice cream bar, starring Organic Valley creams. Praised by chefs for its creaminess, Organic Valley Heavy Whipping Cream contains a minimum 36% butterfat and whips easily into soft, heaping piles of fabulous ice cream. “Organic Valley cream gets its smooth texture and rich flavor from the green pastures where our cows spend their days,” their representatives said. There is probably no better dessert than homemade ice cream and, if you have a churn or ball, it’s really easy to make. Here is a recipe for from Organic Valley that requires only three ingredients: Organic Valley Half & Half or Organic Valley Whipping Cream, sugar and vanilla. Prepare inner ball of ice cream make according to manufacturer’s directions. Add all ingredients to the canister. Turn for 15 – 20 minutes. Enjoy right away as soft-serve ice cream, or transfer to airtight container and place in freezer for 2 or more hours to harden. *Whole cream makes a richer, creamier ice cream. Half & half is lower in fat, will have a different consistency, and takes longer to freeze. Berry Ice Cream: In the last 10 minutes of mixing, add 1/3 cup of favorite chopped berries. Chocolate Chip Ice Cream: Add 1/3 cup miniature chocolate chips. Cocoa Ice Cream: Add 3 – 4 tablespoons cocoa powder. Peppermint Ice Cream: Add ¼ cup crushed peppermint candy. Cookies and Cream Ice Cream: Add ½ cup crushed oatmeal or chocolate chip cookies. Dietitians know the importance of eating breakfast, both from a morning energy standpoint, and because breakfast provides important nutrients needed each day. Did you know that 32% of American kids’ consumption of milk each day comes from the milk they put on their cereal? General Mills has a wealth of materials available to help your shoppers realize the benefits of breakfast, and to better make a point of making time to eat breakfast every day. For consumers who are time or taste challenged in the morning, cereal – with its attributes of convenience, variety and nutritional content — may well be the answer! Cereal is still the leading source of whole grains for American adults, and those who eat cereal also consume more fruits and dairy products. 16% of American children purposefully skip breakfast, making it extremely difficult to catch up on needed vitamins and minerals during the day. Here’s a handout that may be helpful when talking to consumers. If listing specific nutritional benefits seems overwhelming to your shoppers, simply remind them that cereal – especially when eaten topped with fresh or dried fruit and yogurt or milk – provides a complete package of nutrients and energy needed to start the day.